I hope all are well wherever you call home. I myself am still feeling great and at home here in Greendale, Indiana, with Carol Stephenson and her boys. Having already completed my Ohio gig on Monday and setting up a gig for tomorrow in Louisville, Kentucky just south of here, I only need Indianapolis to complete the tri-state loop! In the meantime I’m just about done here with Carol’s garage project. It’s been a great boost to my confidence and a charge to my batteries here with this family. I’ve been able to rest my tired body along with mind with a nice bed, fabulous home cooked meals and engaging conversations. Carol and I have a lot of things in common and can’t wait to be reunited again in Arizona once she sells her home and heads west to Tucson. I’m sure she’ll find some project for me to work on when she settles in to her new home. I in turn will look forward to enjoying her table full of delicious dishes and chatting about my hopefully complete journey. 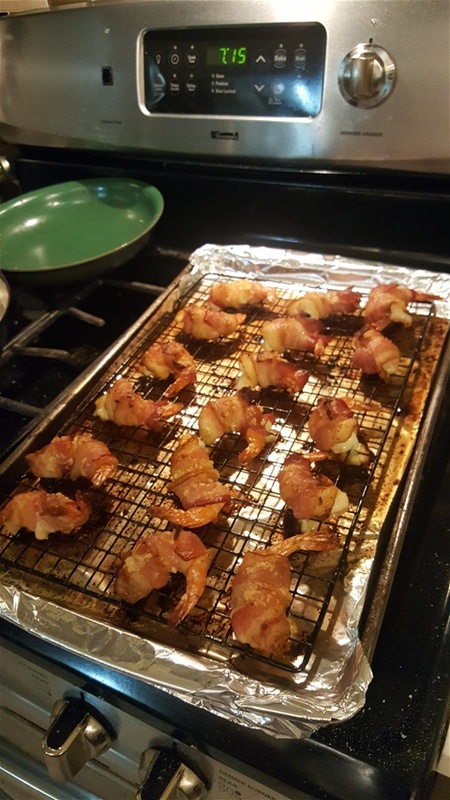 On Wednesday we made time between drywall coats to make flour tortillas and she allowed me her kitchen to make my famous bacon wrapped, cheese filled, butter and garlic shrimp. I was glad she the boys enjoyed it. As much as building and fixing things brings me a tremendous amount of satisfaction, I have to say that cooking for people, especially loved ones is far more enjoyable for the Johnny man. That is a trait I inherited from my mother who taught me many of the dishes I now share with everyone and anyone who is willing to sit at my table, at home and now on the road. I have also enjoyed getting to know these folks better with every passing day. Especially Chuck her eldest son. He is smart and funny young man who is also skilled with many of the same trades as me. A talented artisan in his own right, Chuck has traveled many parts of this great nation and beyond. Working from the garment district in Manhattan to the Burning Man events in Nevada, he and I have become close just sharing our love for the trades and travel. He too knows a little bit about roughing it out there on the road and surviving with very little or nothing at all. Also being at the mercy of generous, loving people who go out of their way to help strangers like me! He is currently single ladies and a great catch for a lucky lady someday. So now I feel the fall weather upon me and I hope to be able to find my gigs faster and my stays shorter in order to beat the really extreme cold that will surely catch up to me at some point. I’m still hopeful that I could be in Hawaii by New Years and avoid any severe conditions that will make travel and finding work more difficult. Only time will tell. In the meantime I will continue to enjoy every day and minute of this wonderful adventure I’m experiencing and sharing with you good folks.